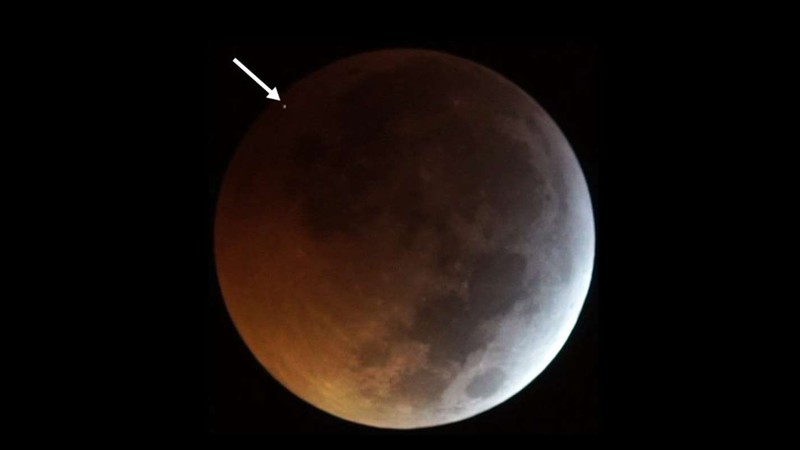 A meteorite struck the Moon during Monday’s lunar eclipse, causing a brief, bright flash on the surface. The telescopes used by MIDAS are equipped with high-sensitivity video cameras and record video continuously during the observing session. These videos are then analyzed by software, which automatically identifies lunar impact flashes and calculates their position on the Moon. Madiedo said the system can detect the moment of an impact flash to an accuracy of about 0.001 seconds. Since 2015, the team has applied photometric filters to some of their telescopes, allowing them to determine the temperature of these flashes. As noted, MIDAS had (prior to yesterday) never captured a meteorite strike during a total lunar eclipse—but it wasn’t for lack of trying. Madiedo said he doesn’t know the exact number of eclipses MIDAS has monitored to date, but, weather permitting, he said every lunar eclipse has been monitored since the survey started. Other groups have also tried to detect lunar flashes during an eclipse, said Madiedo, but none succeeded—until now. Madiedo said the odds of an impact flash of this magnitude is around once every seven to 10 days. His team hasn’t analyzed all the data yet, but a preliminary guess is that the object, likely a tiny asteroid, had a mass around 22 pounds (10 kilograms). On a related note, a recent study suggested the rate of big asteroid impacts on Earth increased around 290 million years ago. This conclusion was reached by studying the history of impact craters on the lunar surface. Our Moon may look nothing like Earth, but when it comes to celestial impacts, we have a shared history.